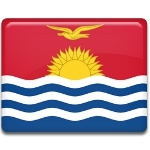 The Republic of Kiribati celebrates its Independence Day on July 12. It is the country's national day that commemorates the independence of Kiribati from the United Kingdom in 1979. Kiribati is a small island country in the central Pacific Ocean. In 1788, the British Captain Thomas Gilbert crossed the islands. They were later named the Gilbert Islands after him. Great Britain established its protectorate over the Gilbert Islands and the neighboring Ellice Islands in 1892. In 1916, the Gilbert and Ellice Islands became a Crown colony. After WWII, the colony's transition to self-determination began. The Ellice Island gained independence as Tuvalu, while the Gilbert Islands became the independent Republic of Kiribati on July 12, 1979. In Kiribati, National Day festivities usually last for several days because the government appoints the dates of several public holidays (Gospel Day, Senior Citizens' Day and National Culture Day) during the Independence Day week. The biggest celebration is held in South Tarawa, the capital of Kiribati. It takes place at the Bairiki National Stadium. It includes President's speech and a colorful parade. Independence Day festivities also involve traditional dance, kite-flying, canoe races and various sports events and competitions.